Aragon is an ultra-luxury oceanfront condominium residence located on one of the most expansive stretches of pristine beach in Boca Raton, FL. Timeless architecture and intricate design combine with elegant living spaces and world-class amenities, earning Aragon its reputation as one of the most elite beachfront luxury condos in all of South Florida. Aragon offers spacious luxury condos that range from 3,700 to 8,500 square feet in size with up to six bedrooms. These impressive units feature expansive open floorplans and private elevator entrances, providing residents the space and privacy of a single-family home with the security and maintenance-free lifestyle of a luxury condo. Each of the beachfront condominiums at Aragon boasts exquisite interior finishes, floor-to-ceiling impact windows, and private wrap-around balconies with unobstructed panoramic ocean, shoreline, and Intracoastal views. Additional features found in Aragon condos include gourmet kitchens with state-of-the-art appliances, sleek marble flooring throughout, luxurious baths with high-end fixtures, huge custom walk-in closets, and a host of high-end custom interior finishes. Aragon Boca Raton is a full-service building offering a multitude of upscale resort-style amenities & services including 24-hour security, valet, concierge, full-time service staff, and an on-site manager. Aragon features a state-of-the-art fitness center with an aerobics studio, steam room, and sauna, as well as a beautiful beachfront swimming pool with towel and water services, a heated lap pool, & beachside BBQ area. The building also features a 2,500 square foot oceanfront terrace with direct access to miles of beach that residents enjoy year-round. Aragon is one of the few pet-friendly condominiums located on the beachfront in Boca Raton. Another benefit to purchasing an Aragon condo is that owners may lease the condos with some restrictions. Private membership to the nearby Boca Raton Resort & Club is available, providing residents with access to golf, tennis, croquet, fine dining, and more! 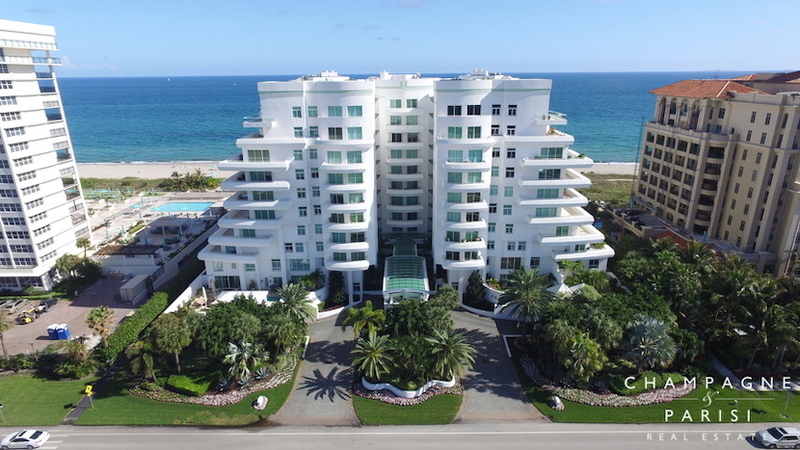 Aragon is located at 2494 South Ocean Boulevard, just south of Camino Real in the heart of the Boca Raton beachfront. The prime oceanfront location is just minutes from the vast selection of premier shopping, dining, entertainment, & nightlife available in Downtown Boca Raton, including Mizner Park, Mizner Park Amphitheater, & the Boca Raton Museum of Art. If Aragon sounds like the perfect beachfront retreat for the exclusive, luxurious lifestyle you desire, you may also want to visit similar ultra-luxury oceanfront condos in Boca Raton including Luxuria & Excelsior. If you would like to learn more about Aragon, or any other Boca Raton condominium developments, please contact us at 561-235-7800. You may also reach us by completing the short online contact information form below, and one of our Boca Raton condominium specialists will reach out to assist you. We at Champagne & Parisi Real Estate pride ourselves on our commitment to professionalism and outstanding customer service and look forward to assisting you with your personal Boca Raton real estate needs.